I really wanted to create a textured background over patterned paper and although this didn't finish quite how I imagined it would I still like the finished result. 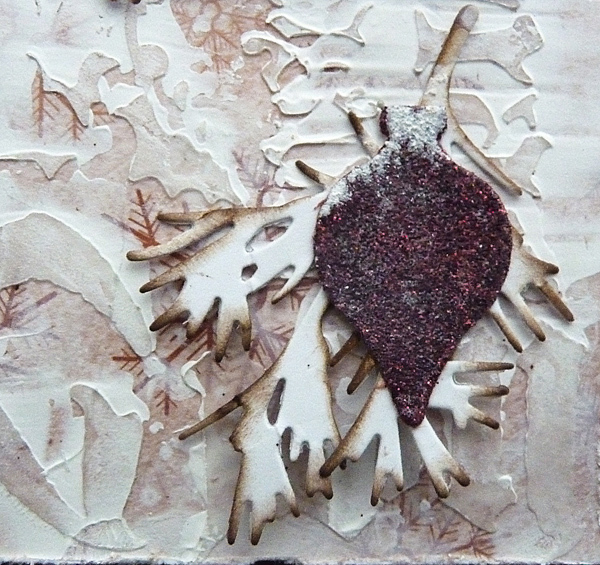 .... and began altering it by dipping and drying it using watery gesso. 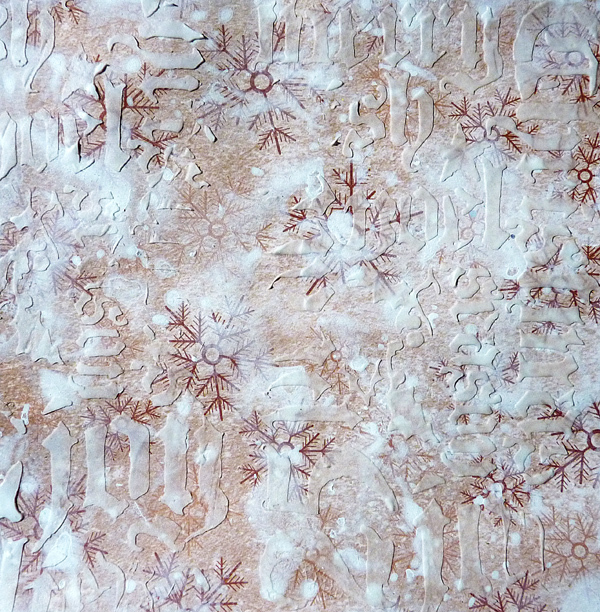 Next I added white texture paste through Tim's Holiday Script stencil and let dry. 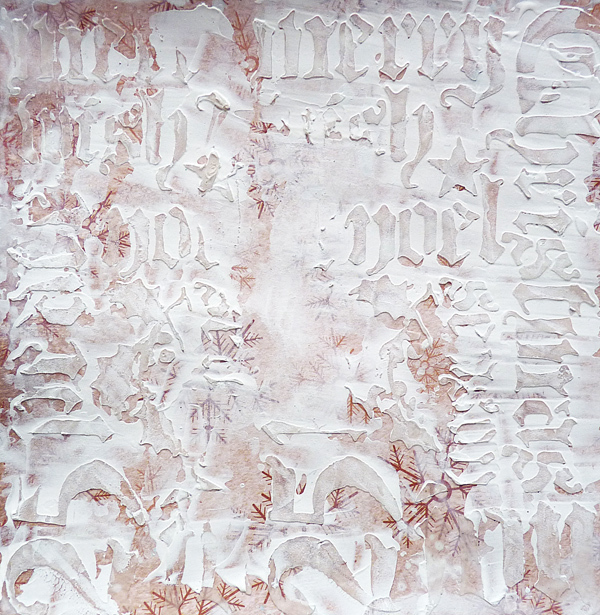 Next I scraped white gesso over the stencilling and watched the letters and words appear, still leaving some interest in the background. 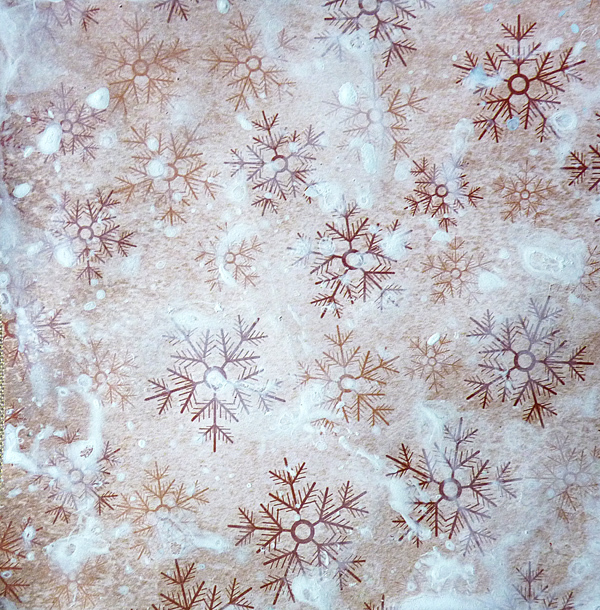 I had found some bought and ready made Christmas ornaments which are ultra glittery, in fact too glittery for what I wanted so I finger washed over a very thin layer of watery gesso which now gives them a chalky bloom, much more in keeping with what was in my head. You can see the difference between them on the two sets below. 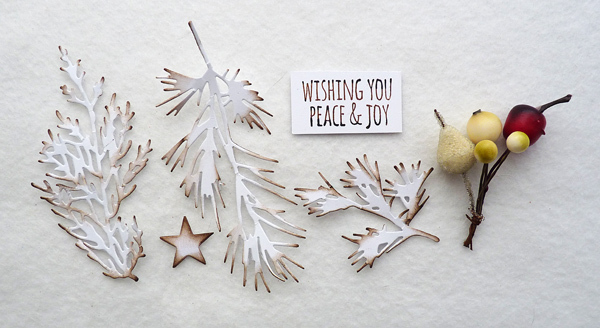 I die cut some holiday greens in white card and inked them with ground espresso, stamped and cut out the sentiment using both coffee and black archival ink and gathered some winter berries to add to the mix. A mount, a star and bows finished off the layering nicely. Again I made two of my design, I need to get a lot more finished and in the box before I need to send them out..
Well it's Monday, this is a scheduled post and Mixology will be over. I'll be back soon to let you know how it went. Beautiful card and I love the background too. Wow! Brenda, das sieht großartig aus. Du hast immer sensationelle Ideen. Ich muss immer wieder staunen. Auch diese Weihnachts-Karte ist ein absoluter "Hingucker"
Und ein dickes Dankeschön für deine lieben Kommentare auf meinem Blog, die mich immer sehr erfreuen. Fabulous Cards! 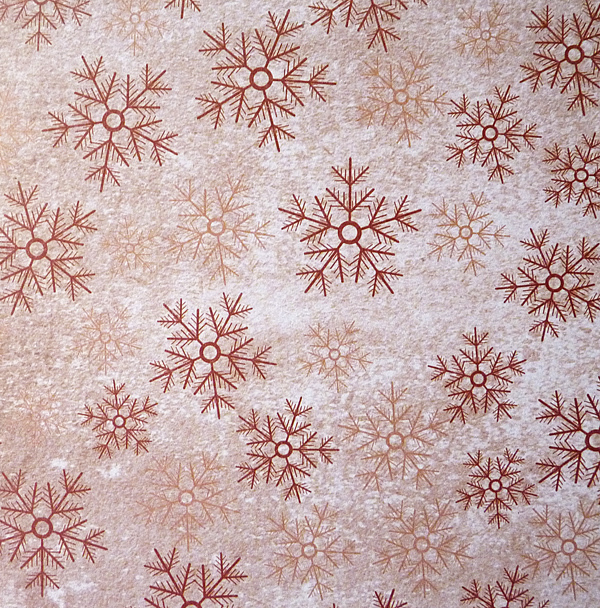 Brenda Just love how you've altered the patterned paper-so effective. Love that you've left so much of it exposed. Beautifully adorned. Great to see you all having a fun weekend - thx for sharing . Wonderful card, Brenda! Love the texture! 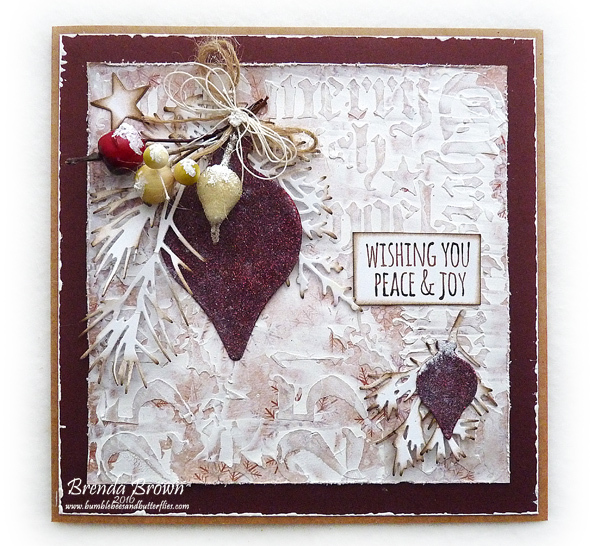 Fabulous card Brenda, love how you've altered the paper and added texture. Gorgeous baubles with the added festive spray. Looking forward to hearing about your weekend. Love your card Brenda. Amazing what you can do with a 'shop bought' background ! And didn't we all have THE most amazing time at Mixology too?? You are a fabulous tutor and I adore my project from your class Brenda. Brenda, I do love how you altered that background! 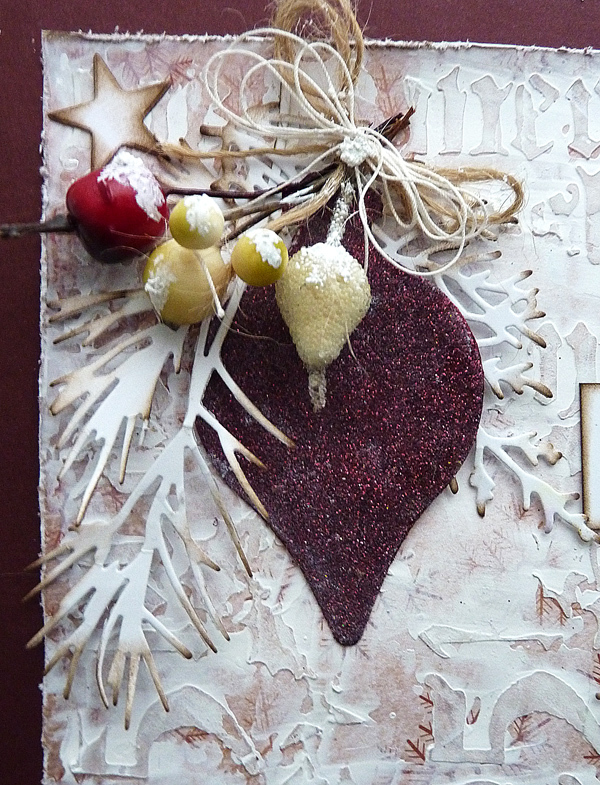 You gave it such interest!Beautiful card! Beautiful set of cards! Great idea to cover up that paper, but leave some of it's beauty peeking through! Now I wish I had gotten that stencil! 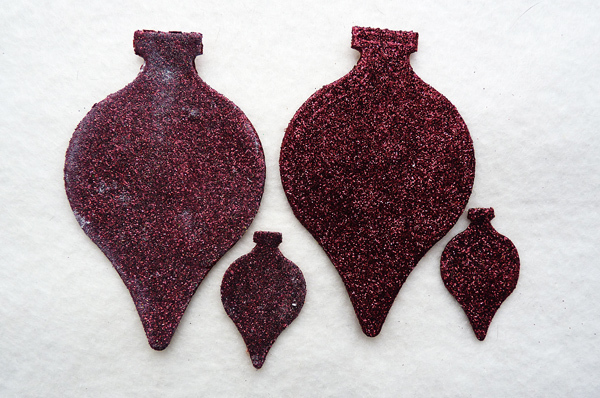 Your ornaments along with the greens and berries are the perfect finishing touch! I'm so inspired by your gorgeous work! Hugs! Beautiful cards! They are going to one lucky recipient if you are boxing them up to send off. 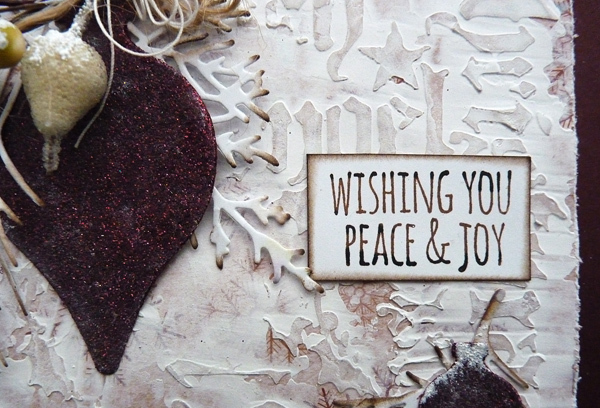 :) Lovely texture on the background and the glittery ornaments are beautiful! 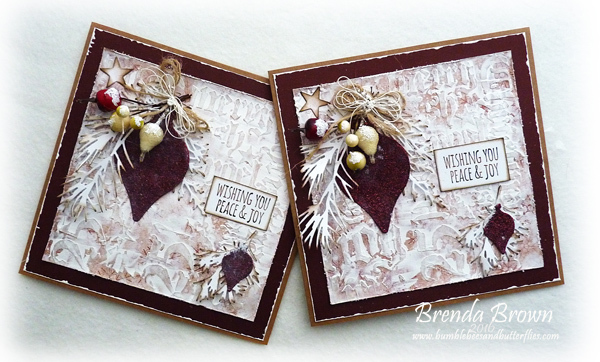 I love these cards Brenda, the background is amazing, so clever. So inspiring, I tried the background technique today at a crop in my hometown. And thanks again for the MoM class! Loved your class and make and take! It was so nice to meet you again! Awesome cards! I love the technique with the modeling paste and gesso. I tried it out myself on a local crop last weekend. As I said before, you are so talented, you never stop to surprise with your projects. And it was so nice to meet you again at MoM. And your class and make'n' take was brilliant. Stunning cards! I really love the artsy background - starting to think I "need" that wordy stencil after all - and the contrasting baubles and frame.